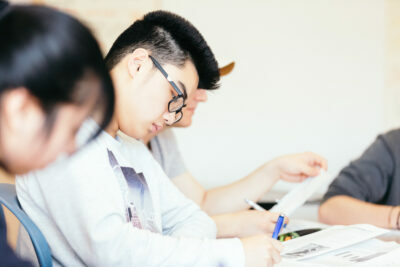 “WONDERFUL TEACHERS, WELL-STRUCTURED PROGRAM, EXCELLENT WRITTEN MATERIALS My son and his cousin went along to SPECTRUM (the Footscray Maths/English Scholarship Preparation classes) on Saturdays for the best part of a year. I was surprised and pleased that both boys were offered scholarships at APS schools and the course provided a huge confidence boost.” – Tara Wilkinson, Parent. At Spectrum Tuition, we are passionate about scholarship examination preparation. We believe that every student should be given the opportunity to perform at their best in order to improve their chances of securing one of these highly sought after positions at their chosen school. Preparation for scholarship and selective exams differ greatly from school work and we have spent many years developing a program and accompanying materials to improve your child’s chances of success. Even if your child is already quite talented at school, we have found that questions on scholarship and select entry exams test students on material that may be one or two years ahead of the school curriculum. Additionally, many students may not be accustomed to answering 60 of these types of questions in 30 minutes! It is therefore vital to help your child become familiar with the different types of questions that are likely to come up, as well as practising good test taking techniques so your child is more confident during the test, which will help put your child in a much better position to gain a scholarship or place in a selective program. Due to the extremely challenging nature of these exams, we recommend that you give your child ample time to prepare. The most complete option to give your child every chance of achieving success. Through weekly classes, we will teach your child the actual steps on how to answer specific questions that are highly likely to come up on the exams. We take students through a carefully designed course, building up confidence and knowledge through worked examples, practice questions to complete, the opportunity to ask questions and receiving detailed feedback via our online tracker: www.myspectrumtuition.com. We provide carefully designed regular cumulative exams to test students’ knowledge from the beginning of the course up to that point to allow your child to continually revise and consolidate their knowledge to increase the likelihood of remembering concepts taught even at the beginning of the course. Enrolment in our selective preparation courses will familiarise students with types of questions likely to come up on the exam. We have three campuses located around Melbourne: Footscray, Albion and Hoppers Crossing. Useful in catching up on missed work in the event of late enrolment or if you cannot attend classes at our campuses in Melbourne. Our course books used in classes will be available to purchase containing explanations, worked examples and practice questions. You will be assigned a dedicated person to personally correct your work and provide you with written feedback on how to improve.Correspondence courses come with 10 email support questions to follow up on feedback or to clarify any concepts presented in the course materials. 10 email support questions per subject. Completed booklets may be scanned & emailed back for correction and feedback (Please allow 14 days for correction and return). Recommended after the majority of topics have been introduced so students can begin to focus on their timing. Our exam packages will cover the widest range of questions in a very short timeframe to familiarise your child with the format and level of difficulty. Our advanced packages will contain FULL worked solutions for each question so your child will understand why they answered specific questions incorrectly.Testimonial from a parent whose child successfully gained entry into the MacRobertson Girls’ School in 2014:Selective entrance exams are very competitive and providing the ability for kids to do more practice in timed conditions simulating the exam pattern is the best gift we can give to our children. Spectrum has complemented this and made it easy for kids to practice the exam at home. The books cover all the aspects of the exam pattern and the detail answers help the kids to develop fast and innovative techniques for performing the best. These books are a must for anyone preparing for the selective school exams and will surely increase your childrens’ chance of success – Srinivas, parent.Click here to purchase exam packs or call 1800 668 177 for free to find out which exam pack is right for your child. We specifically designed these writing books to help students who are anxious about the writing component of any selective entry or scholarship exam that requires a narrative and persuasive essay to be written under strict time constraints.We GUARANTEE your child will be more confident approaching the writing components and learn innovative techniques to produce winning essays after working through these practical guides.Click here to purchase our high value persuasive and narrative writing bundle now! Our simulated exam is designed to provide you with feedback and guidance on what it’s like to sit the Selective Schools Entrance Test. It’ll also highlight areas you still need to work on before the big day. If you want to be prepared for the real exam this is the program for you.Prepare for the Selective Schools Test by sitting a simulated exam – real time constraints, real exam conditions and relevant questions.Receive answers and advice during a 3 hour feedback session from our team of expert tutors. The following timeline outlines the recommended options available to help your child get prepared, depending on where they are in the preparation cycle. Enrolment in regular classes at a higher level before enrolments in the selective test preparation classes open. We have three campuses located around Melbourne: Footscray, Albion and Mount Waverley. Recommended option: Weekend classes: Enrolment in our selective preparation courses will familiarise students with types of questions likely to come up on the exam. Supplemented by private tutoring Start considering if students are having difficulty grasping specific concepts and skills taught in class. Other options: Correspondence course: Useful in catching up on missed work in the event of late enrolment.